CMT has arranged special discounted room rates for delegates at Tokyo Marriott Hotel. Room ONLY at JPY 31,088 / JPY 31,288 nett (SINGLE/DOUBLE, subject to rate & room availability). Breakfast is at JPY 3683 nett per person. Room with Breakfast at JPY 34,771 / JPY 38,454 nett (SINGLE/DOUBLE, subject to rate & room availability). Celebrating the 10th edition of the "Asia Biomass Markets' Powerhouse Meet" in Tokyo this May. Register for the 4-days full bundle & enjoy maximum advantage and discount! Contact huiyan@cmtsp.com.sg for more information & sign-ups! 24+ hours of content – Engage in presentations & discussions on biomass demand & logistics, to analysing economic potentials from the efficient biomass supply chain management, and case studies. Addressing pertinent issues in sustainability – Engage in the full-day pre-conference discussion with policies advisors in Japan and South Korea, expert large-scale biomass co-firing utilities, biomass suppliers and certification panel. 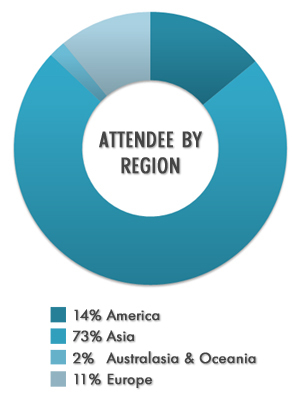 70% are senior-level executives – The must-attend keynote with senior officials & executives; Network and establish contact with key influencers and decision makers. 20+ networking hours - Take advantage of CMT Connect, & many opportunities for you to network with fellow delegates and speakers during refreshment breaks, lunch, cocktail receptions, as well as the pre-conference workshop and post-conference site visit. Start networking before the conference begins - Take advantage of CMT Connect and start planning your meetings before 13 May 2019. All Green Timber Products, AltEnergy Mag, Altri, Altus Renewables, Amandus Kahl, An Viet Phat Energy Co, Andritz, AS Graanul Invest, Ayo Biomass, Berkana Power, Bio Based Press, BioEndev Solutions, BioEnergy Europe, Bioenergy Insight, Biomass Industrial Society Network, Biomass Power Association, Boreal Bioenergy, BRUKS, Business Brains Consultancy, Bussan Sumisho Carbon Energy, Canadian National Railway, CellMark, CellMark Asia, CGN Daesan Power, CGN Yulchon Generation Co, Chubu Electric Power, Clean Electricity Generation, Cleantech Business News, Control Union, Daehwa I&C Co, Drax Power, ECO Business Pte Ltd, Ecological Restoration Institute, Econecol, Energy Update, Enviva, Equis Bioenergy, eRex, Eurasian Chemical Market, Evergreen Fibreboard, Fednav, Fibreco Export, Floponor, Forest Biomass Energy Association, Forest Steward Council, Fram Renewable Fuels, FutureMetrics, Gama Plantation Group, Gas & Power, Georgia Biomass, Gladmak Intl Corp, Global Information, Government of British Columbia, Green Diamond Resource, Green Energy Supply, Green Gold Label, GREENEA, Hanwa, Hatton-Brown Publishers, Hawkins Wright, Hokuriku Electric Power, Hsihou Enterprise, Idemitsu Kosan, Indufor Asia Pacific, Istana Kawi Kencana, Iwatani, J. Lauritzen, Japan Paper Association, JERA, JFE Shoji Trade, Joban Joint Power, Kanematsu, Kansai Electric Power, Kett Electric Laboratory, Korindo Group, Long Hai Phat Trading & Manufacture Co, Marubeni, MC Bio, Mid-Ship Group, Mitsubishi Corp, Mitsubishi Corp Power, Mitsubishi Research Institute, Mitsui, Mitsui O.S.K. Lines, MK Solar, Mokpo City Gas, Momentum Capital, Nature’s Flame, New Energy Development Co, NYK Bulk & Projects Carrier, NYK Line, OCI Co, Open Agriculture, Oregon Torrefaction, ORIX, Osaka Gas, Pacific BioEnergy, PAL, Pegasus Commodities, Phunsub Charcoal Wood, Pinnacle Renewable Energy, Pivot Point, Pöyry, Prince Rupert Port Authority, Prodesa, Prospect Co, Provident Biofuels, PT Parawood, PT SMART, PT Sumber Tani Agung Group, PT. Agro Pancasakti Bangsa, PT. Bakrie Sumatera Plantations, PT. Bioenergi Semesta Mas, PT. Dharma Satya Nusantara, Rambu Energy, Renewable Energy Institute, RENOVA, RGCC Technical Services, RIM Intelligence, Russia Forest Products Group, RWE Supply & Trading, Samkwang Glass, SCS Global Services, SGS, Shandong Rotex Machinery, Siwertell, Skeena Bioenergy, Southern Acids, Sumitomo Corp, Sumitomo Mitsui Trust Bank, Sustainable Biomass Partnership, The Bioenergy International, The Chugoku Electric Power, The University of Tokyo, Tokuyama, Tolko Industries, Toyota Tsusho, TSI, Uju Electronics, Ultrabulk, University of Washington, Valmet, Voyage Power, Vyncke, Web Green Chemical, Weyerhaeuser, Wood & Co. Consulting, Wood Pellet Association of Canada, Woodgrain Millwork, WorldOils and many more. The Sakata Biomass Power Plant was constructed in the Sakata Rinkai Industrial Park facing Sakata North Port. It will be operated by Summit Sakata Power Corporation. The 50 MW biomass power plant will be the largest of its kind in Yamagata Prefecture and also one of the largest of its kind in the Tohoku region. Biomass fuels, such as Japanese wood chips and imported wood pellets, will be procured through Sumitomo Corporation. The Japanese wood chips will comprise unused wood materials and timber off-cuts mainly generated in Yamagata Prefecture and will cover about 40% of the biomass fuel, while wood pellets imported from across the world will also be used as fuel. Electricity generated at the plant will be sold to power consumers through Summit Energy. -- CMT가 올 5월 13~16일에 도쿄에서 제10회 Biomass Pellets Trade & Power Summit을 개최한다. 올해는 METI, Renova, eRex, 스미토모상사, WPAC을 포함한 다수의 주요 업계 관계자를 비롯해 참가자 수가 350명이 넘을 전망이다. (도쿄 2019년 3월 27일 PRNewswire=연합뉴스) 도쿄에서 열리는 이 연례행사는 35개국에서 온 참가자를 위해 네트워킹 기회를 제공한다. 이 회의의 특징은 Kagami-Wari(전통 사케통 의식), 첫날에 열리는 칵테일&디너 리셉션, 둘째 날에 열리는 폐회 칵테일 리셉션에서 제공하는 정보교류의 기회다. 이들 행사는 각각 RENOVA, Inc., 캐나다 우드펠릿협회(Wood Pellet Association of Canada, WPAC) 및 Cellmark가 후원하고 개최한다. 여기에 스미토모상사, Valmet, Enviva, Control Union, Amandus Kahl, VYNCKE가 후원업체로 합류하고, Airex Energy, CPM Europe, TSI, PAL, ANDRITZ, CEG, Bruks Siwertell, OPPS GROUP, Shandong Rotex Machinery, Arbaflame 및 Kett Electric Laboratory가 전시업체로 합류한다. 주최측인 Centre for Management Technology (CMT)의 발표에 따르면, 일본 경제산업성 자원에너지청 신에너지과의 기쿠시마 다이지로(Daijiro Kikushima) 과장보좌가 '일본의 바이오매스 에너지 정책('Japan's Biomass Energy Policy) 과 2030년 전망'에 관한 개막 기조연설을 진행할 예정이라고 한다. 이후에는 다음과 같은 3건의 기조 발표가 이어질 예정이다. eRex, Equis Bioenergy, Samkwang Glass Co., Vyncke, Renova, NYK Bulk & Projects Carrier, Renova, CN, Prince Rupert Port Authority, Amandus Kahl, Valmet, The University of Tokyo, Korea Forest Biomass Energy Association, Hanwa, Indufor, Hawkins Wright, Voyage Power, Enviva, Altus Renewables, Pacific BioEnergy Corporation, Russia Forest Products (RFP) Group, Marubeni, Gama Plantation Group, Mitsubishi, Georgia Biomass, Green Energy Supply, Iwatani, Cellmark, Fibreco Export 등. 이번 회의에 앞서 '일본과 한국의 수입 바이오매스 지속가능성 및 추적성 요건(Sustainability & Traceability Requirement for Imported Biomass in Japan & South Korea)'에 관한 워크숍이 열릴 예정이다. 이 회의는 사카타시에 위치한 Summit Energy의 신규 50MW 바이오매스 발전소에 대한 특별 견학으로 마무리된다. 추가 정보는 행사 웹사이트를 참조하거나 담당자 Huiyan Fu에게 이메일(huiyan@cmtsp.com.sg) 또는 전화 +65 6346 9113로 문의하면 된다. "Outstanding presentations, great discussions, I think a lot of people got their investment back several times over for this workshop!" "Insightful meeting for both suppliers & buyers"
"The best forum for obtaining the full spectrum of information in one place"
"The single most important biomass conference in East Asia, everyone is here, producers, consumers, traders, logistics and more"
"It is really worth to join this conference." "Most important biomass conference of the year"
"Well-organized and coordinated. Good time control & competent facilitators"
"It was really nice opportunity to join this conference as a speaker with special thanks!" 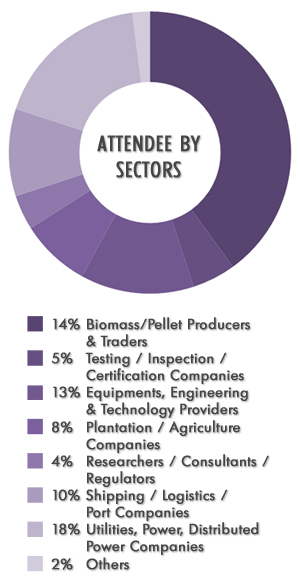 How you will Benefit from being Connected at CMT’s 2019 Biomass Series? How Can You Get Connected ? Siwertell, a global market-leading company in dry bulk handling with engineering and service solutions employed in hundreds of import and export terminals worldwide, is exhibiting at CMT’s 10th Biomass Pellets Trade & Power. The summit is held in Tokyo, Japan on 13-16 May, 2019. Siwertell’s reliable and efficient products and solutions provide the cleanest dry bulk handling performance available with minimal environmental impact. Attend CMT’s 10th Biomass Pellets Trade & Power in Tokyo, Japan on 13-16 May, 2019. Japan’s energy producer Renova is building a 74.8-MW Tokushima Tsuda biomass power generation project in Tokushima prefecture and the company recently arrived at a final investment decision (FID) and achieved financial close for the project. The proposed biomass power plant will use wood pellets and palm kernel shells (PKS) as a feedstock. It is expected that the construction will start in the spring of 2019, while the commissioning is planned for March 2023. 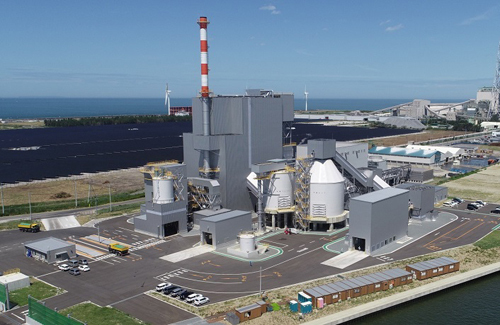 With an annual power generation of about 500 million kWh, the Tokushima Tsuda biomass power generation plant will be able to meet the annual power consumption of approximately 150,000 households. Renova is developing this project with other companies including - Tokushima Tsuda, Osaka Gas, NEC Capital Solutions, Mitsubishi Electric Credit Corporation, Genboku, Dairi Lumber and Tokushima Denki Sangyo. Contact Ms. Huiyan Fu at huiyan@cmtsp.com.sg or +65 6346 9113 for more details. Most of the biomass power producers in Japan are selling their output via the government's feed-in tariff (FiT) program. It requires utilities to buy renewable energy at a fixed price. At the moment, large biomass plants, that use wood or agricultural waste feedstock, can sell at a fixed rate of 21 yen per kilowatt-hour. However, the program isn't cost competitive compared to coal energy. eRex, Japan's power supplier, is planning to build the largest biomass power plant to date in Japan with the aim that the scale of the facility will provide healthy margins and allow to skip FiT program altogether. Right now, eRex is conducting feasibility study, with the expected plant planned sometime in 2024 or 2025 in eastern Japan. To be built at a cost of approximately 90 billion yen ($812 million), the plant will have a capacity of 300 MW. eRex plans to reap economies of scale in operation and fuel procurement at the proposed plant and aims to make it as economical as coal energy, which costs around 12 yen per kilowatt-hour. Lean more about Japan's latest biomass energy markets at CMT's 10th Biomass Pellets Trade & Power on 13-16 May, 2019 in Tokyo, Japan.